The Criterion Collection launches its 2017 campaign today with a raucous one-two punch that summons fond memories of Hollywood’s Golden Age while jabbing its finger into the chest of today’s corrupt media hacks. "His Girl Friday", that epitome of classic screwball comedy, gets the deluxe treatment in a handsome dual-disc Blu-ray edition that also serves as a fancy showcase for its influential predecessor "The Front Page". The key characters of this very good remake of Lewis Milestone's film "The Front Page" are Walter Burns, (Cary Grant), a prominent editor of a big newspaper in Chicago, and Hildy Johnson (Rosalind Russell), a brilliant reporter with an impressive record. They are former colleagues and partners who have recently divorced and agreed to stay out of each other's lives so that they can quickly rebuild them. But Walter has not been entirely honest and has come up with a desperate plan to stop Hildy from relocating to Albany with her next husband (Ralph Bellamy), an insurance agent who believes that his future wife cannot wait to share an old family house with his mother. Walter's plan is to distract Hildy with a big case and convince her to cover it for him in exchange for a big fat check. • Hawks on Hawks - presented here is a new program which features clips from taped audio conversations between director Howard Hawks and Peter Bogdanovich from 1972, and a 1973 interview with the director conducted by Richard Schickel. The material covers the casting process, some of major differences and similarities between Lewis Milestone's The Front Page and His Girl Friday, some specific lensing and editing choices, the use of dialog (and specifically the decision to use overlapping lines), etc. With clips and stills. In English, not subtitled. (11 min, 1080p). • Lux Radio Theatre - presented here is a Lux Radio Theatre adaptation of His Girl Friday, featuring Claudette Colbert as Hildy Johnson and Fred Murray as Walter Burns. The adaptation initially aired on September 30, 1940. In English, not subtitled. (60 min, 1080p). • Featurettes - presented here are four short archival featurettes that focus on the history, legacy and success His Girl Friday and the career of its creator, director Howard Hawks. 1. On Assignment: His Girl Friday - featuring clips from archival interviews with author David Thompson (The Biographical Dictionary of Film) and critic Molly Haskell. In English, not subtitled. (9 min, 1080i). 2. Howard Hawks: Reporter's Notebook - featuring clips from an archival interview with author Todd McCarthy (Howard Hawks: The Grey Fox of Hollywood). In English, not subtitled. (4 min, 1080i). 3. Funny Pages - featuring archival footage from The Front Page and His Girl Friday and information about the classic play by Ben Hecht and Charles MacArthur. In English, not subtitled. (4 min, 1080i). 4. Rosalind Russell: The Inside Scoop - featuring information about the life and career of actress Rosalind Russell, plus archival footage. In English, not subtitled. (4 min, 1080i). • Lighting Up with Hildy Johnson - in this brand new visual essay, film scholar David Bordwell, coauthor of Film Art: An Introduction, discusses the auteur qualities of Howard Hawks' films and the brilliant structure and style of His Girl Friday. In English, not subtitled. (26 min, 1080p). 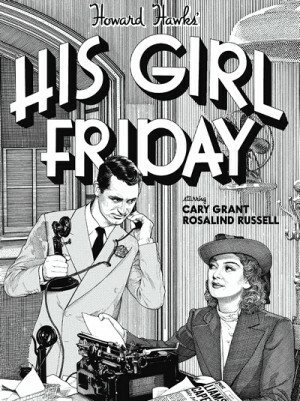 • Trailer - original restored trailer for His Girl Friday. In English, not subtitled. (3 min, 1080p). • Teaser - original restored trailer for His Girl Friday. In English, not subtitled. (2 min, 1080p). • The Front Page (1931) - presented here is Lewis Milestone's film The Front Page, starring Adolphe Menjou, Pat O'Brien,a and Mary Brian. MPEG-4 AVC/1080p/English LPCM 1.0. With optional English SDH subtitles. • Restoring The Front Page - this new featurette focuses on the recent 4K restoration of The Front Page and highlights some of the differences between the final restored version of the film and previously available versions. Included in the featurette are interviews with Dr. Hart Wegner (former chair, UNLV Department of Film), Francisco Menendez (founding artistic director, UNLV Department of Film), Michael Pogorzelski (dierctor, Film Archive, Academy of Motion Pictures Arts & Sciences), and Heather Addison (professor and chair, UNLV Department of Film), amongst others. In English, not subtitled. (24 min, 1080p). • Ben Hecht - in this brand new documentary, Ben Hecht expert David Brendel takes a closer look at the life and diverse legacy of the prolific writer, some of the key themes that defined his best work, and some of the classic Hollywood films that were inspired by it (Foreign Correspondent, Scarface, Kiss of Death, Ride the Pink Horse). The documentary was created by the Criterion Collection in 2016.. In English, not subtitled. (26 min, 1080p). • Radio Theater - presented here are two radio adaptations of The Front Page. 1. 1937 Adaptation - featuring Walter Winchell as Hildy Johnson and James Gleason as Walter Burns. In English, not subtitled. (59 min, 1080p). 2. 1946 Adaptation - featuring Pat O'Brien as Hildy Johnson and Adolphe Manjou and Walter Burns. In English, not subtitled. (32 min, 1080p). BluRay files deleted or not found on HitFile. Could you please check or re-up or fuss at Hitfile? thonhy: Ouch !. Part one : Server errror. MovieWorld, can you reup ?. Regards. lenir: Thank you very much. No hurries. movieworld: I will do it soon. Unfortunately now ausfile has problems with file uploading.